Despite the time-honored value of rewarding hard work, our tax code gives preferential treatment to income derived from pre-existing wealth, rather than income earned from work. Our two-tiered system taxes investment income, such as capital gains and dividends, at much lower rates than income from salaries and wages. Capital gains and dividends should be taxed at the same level as ordinary income – a common sense policy that was also recommended by the Deficit Commission and was the law of the land as recently as 1990 under President George H. Bush. What’s wrong with this two-tiered tax system? This two-tiered tax system is an affront to the core American value that hard work will enable one to climb the economic ladder. Unfortunately, wealth is what really pays under the current tax code, not work. A comparison of two hypothetical cases demonstrates this gross inequity. Case 1: A neurosurgeon who is the first in her family to attend college, worked hard, broke through the glass ceiling, and now earns $400,000 per year will pay a top marginal income tax rate of 39.6%. This tax helps to support the public structures and services that have made and will continue to make her prosperity possible. 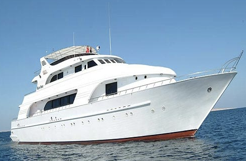 Case 2: A wealthy heir who, instead of working, jaunts port-to-port on a yacht while collecting $400,000 a year in investment income from his multi-million-dollar inheritance, will pay a top marginal tax rate of only 20%. The same preferential treatment applies across the income spectrum. For example, a family earning $50,000 from regular employment would pay a top rate of 15%, while another family earning $50,000 from capital gains would pay a rate of zero (see below). The general trend is such that the greater the household income, the greater the portion of it is coming in the form of investment income, such as capital gains and dividends. For example, the typical American household, with an income of $58,500, receives only 0.5% of its income from capital gains. On the other hand, those in the top 0.01% of income earners, with an average income of $35 million, receive over 44% of their income from capital gains. Because income composition changes so dramatically as one goes up the income scale, the lower tax rates for capital gains and dividends erode the progressivity of our tax system. 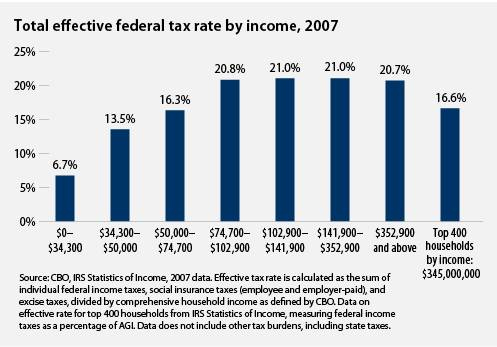 Instead of going up as income rises, the effective tax rate is hump-shaped. The highest effective tax rate is paid by households earning between $100,000 and $350,000, which are certainly not the richest households. For incomes beyond that, the effective rate begins to decline. According to a 2012 report, 69 members of the Forbes 400 were born with enough wealth to place them on the Forbes 400 list. Many of the rest of the Forbes 400 members were born to families with substantial wealth, giving them a huge head start relative to the vast majority of Americans. In essence, some very fortunate among us are born with a tax break. Regardless of the paths these individuals have chosen, the income they receive from the capital gains and dividends of their family wealth is taxed at only 20%, not the top earned income tax rate of 39.6%. The Civil Rights victories of the 1960s represented historic gains for African-Americans and other people of color. From the Voting Rights Act to the Civil Rights Act, legal rights long granted to Whites were guaranteed to all citizens, regardless of race. These monumental changes, however, did not alter the fundamental economic order. Our country's wealth continues to be disproportionately held by Whites. That wealth has been transferred through the power of inheritance to each successive generation. Even today, Blacks have only 20 cents of net wealth and Latinos have 27 cents to every dollar that Whites hold. Our country's two-tiered tax system rewards those who already have wealth, and yanks up the ladder of opportunity for those who don’t, deepening the racial wealth divide in the process. As deep and damaging budget cuts are made at both the state and federal levels, it is an outrage that the special tax break for unearned income remains. The reduced tax rate for dividends and long-term capital gains will cost $160.8 billion in 2013 alone.